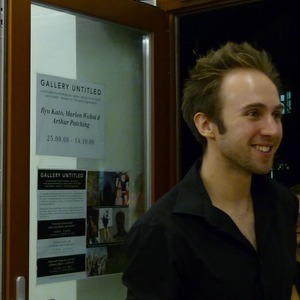 BORN 11/09/1979 IPSWICH, ENGLAND VIDEO ARTIST LIVES AND WORKS IN BERLIN "Who was actually pushing the switch? I was, but he kept insisting. I told him "No," but he said you got tokeep going. I told him its time we stopped...Why didnt you just stop? He wouldnt let me. I wanted to stop. I kept insisting to stop, but he said "No.."Why didnt you just disregard what the experimenter said? He says "its got to go on, the experiment." (Milgram 1965, 128-9) My Work explores hidden aspects in the relationship between individuals and medicine and contrariwise the secret motivations of medical actions and rituals. Though medicine in our society is mainly seen as something positive, I am interested in those small moments and gestures, where we can peel back the layers to look behind the facade. To enable these situations to develop I am constructing a very precise atmospheric feel in the film, by the use of clinical equipment, technology, costumes that create a realistic component, which is in calculated contradiction to the places, that could be nowhere or everywhere. The room is ambiguously empty or dark, or it could be happening outside on the Street, so you can imagine the pieces as staged, either in the theatre on the one side or as nightmares on the other.